All STIHL Products shown in the current STIHL Sales Catalogue are covered for a period of 1 year from the date of purchase to the ORIGINAL PURCHASER, when used for the designated purpose of that product by semi-professional and professional users (including Hire, Rental and Construction Industry. 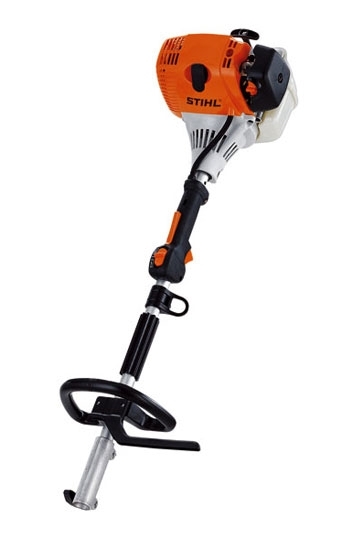 Stihl KM100R 31.4cc loop handled KombiEngine is a popular selection by more professional users or larger land owners who are looking For more power for harder more prolonged tasks. The loop handled engine units are a top selection for use with the greass trimmer, pole pruner, hedge cutter, blower and sweepers. They can also be used with the edger, brushcutter and pick tine cultivator. The Stihl KombiEngines allow for a mix of tools that ensure a wide variety of garden chores are now achievable and affordable.